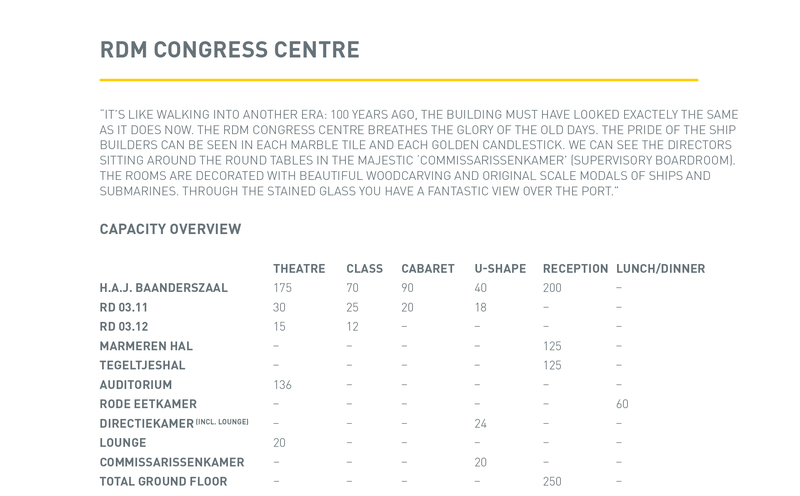 The Congress Centre in RDM’s old headquarters offers multifunctional space for small and large events. The Congress Centre’s halls and rooms equipped with modern facilities have not lost their authentic appearance. There is something for everyone due to the wide selection of rooms. The Art Deco boardroom and the Management boardroom are especially suitable for meetings. The splendid Marble Hall with its beautiful stained-glass windows can be used for afternoon drinks or a social reception. The Auditorium offers modern AV equipment and college classroom seating arrangements. For more information, contact RDM Events via email [email protected] or telephone +31 (0)10 293 35 55. Download the English brochure here.